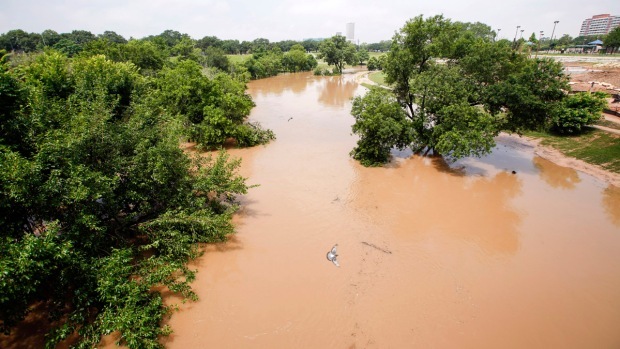 The vacation house where two families were to spend Memorial Day weekend was already gone, swept down the swollen Blanco River, when Carissa Smith's husband arrived. All he found was a Chevrolet Suburban slammed against a tree, the engine running. The fate of those who were inside the home was still unclear Tuesday. 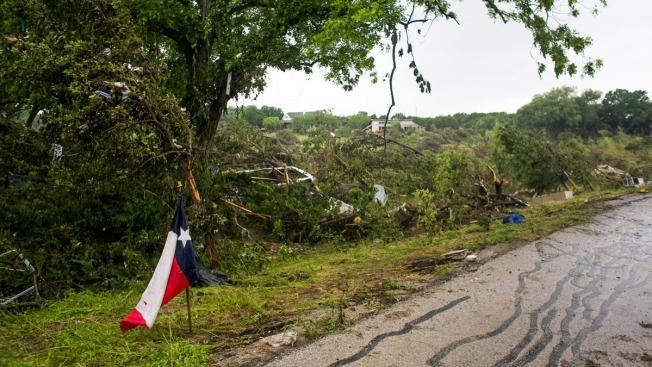 Recovery teams were to resume looking for as many as a dozen people who may have been staying at the two-story house in this small town in the Texas Hill Country, where punishing rains and other severe weather have destroyed or damaged more than 1,000 homes and killed at least four people statewide over the long holiday weekend. Meteorologists say storms that have been virtually parked over Texas for weeks are not yet done, raising the prospect of even more flooding. Some of the worst damage so far has been in Wimberley, a popular bed-and-breakfast getaway surrounded by vineyards near Austin. Hundreds of trees on the banks of the Blanco, which crested to a record 40-plus feet and tripled its flood stage, toppled on or near houses. Witnesses said the vacation house was carried into the river by floodwaters and crashed into a bridge downstream. Bent concrete pylons and a few scattered horseshoes remained on the home's limestone slab. At the top of a small slope that had led down to the house, the back wheels of a Suburban dangled above a ditch and its tailgate was smashed against a tree. Smith, who owns the land next door, said the car belonged to the homeowner. "We think he went back in to get everybody out. Problem is, the house is up on stilts, so when they climb down the stairs, they had to climb into the water to get out," said Smith, whose aunt and mother both live nearby. "And I'm sure they realized that when they got in there, it was too late." Smith said she had spoken to relatives of the homeowner, a retired doctor. Young children were among those believed to be missing. One person who was rescued from the home told workers that the other 12 inside were all connected to two families, Hays County Judge Bert Cobb said Monday night. But by early Tuesday, Hays County spokeswoman Laureen Chernow said there were discrepancies concerning how many people might have been inside the home. She said officials were unable to confirm that 12 were in the house. Eight of the missing were friends and family who had gathered for the holiday, said Kristi Wyatt, a spokeswoman for the City of San Marcos. Three more people were members of another family in a separate situation. An unrelated person was also missing, Wyatt said. Rescue teams planned to end their search efforts and move into a recovery phase. "When you hit a bridge moving at 35 to 40 mph on the river, it's equivalent to a 70 mph head-on" collision, said Trey Hatt, a spokesman at the Hays County Emergency Operations Center. Floods in Houston and central Texas Monday night left fans at the Rockets game stranded, turned highways into rivers and even filled parking garages with several feet of water. See videos posted on social media of the weather and its aftermath.